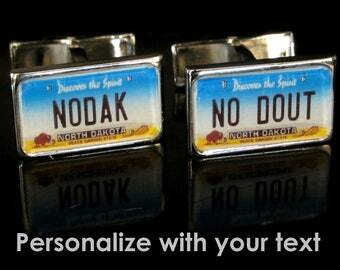 Announcement Evoke a sense of nostalgia with a unique personalized gift. There is something about old license plates, road signs, city limit signs, coins, watches, typewriters, etc. that bring back memories of a car once owned, a road once traveled, or street sign once stolen (not an admission of guilt!). Customize your own jewelry with one of our unique designs and you'll never want to wear boring jewelry again! 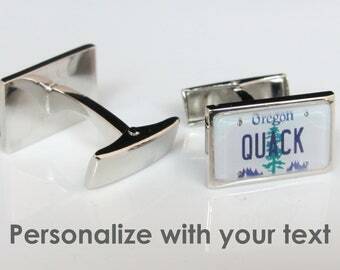 Evoke a sense of nostalgia with a unique personalized gift. There is something about old license plates, road signs, city limit signs, coins, watches, typewriters, etc. that bring back memories of a car once owned, a road once traveled, or street sign once stolen (not an admission of guilt!). Customize your own jewelry with one of our unique designs and you'll never want to wear boring jewelry again! This is a gift for my granddaughter, who recently moved to Kansas and whose favorite TV show is Supernatural. Perfect! Quality is very good, and shipping was fast. Welcome to PL8LINKS! We strive to make the best looking and highest quality cufflinks around. We do not skimp when it comes to making a fantastic and reliable product. If you are not 100% satisfied with our products, we would be glad to provide a refund. If the product is defective or broken, please send me a picture and I can either provide a refund or ship a replacement. Otherwise, return shipping will be the responsibility of the buyer before a refund can be issued. Payment to be made via paypal, bulk orders may need a special listing to be created, please contact me at pl8links [!at] gmail.com. Items are normally shipped first class within three days of purchase. If you are needing an item rushed, please send me a message! Please contact me at pl8links [!at] gmail.com if you would like to place a custom bulk order.